5th stay here and likely the last. Always hassles over stay dates if they are not first of month to last of the month. IE, 15th of November to 15th of December creates a problem for them as far as charges go. Site still says best WIFI in the valley and it is still virtually non-existant (one of reasons we no longer plan on returning). Getting Cox in the park is an option for long term campers but is not cheap. New thing this year was park employees trying to tell you how to back your trailer and they had no clue. Saw this several times and several frustrated campers. Still lots to do and well kept, just too many other frustrations to want to come back. 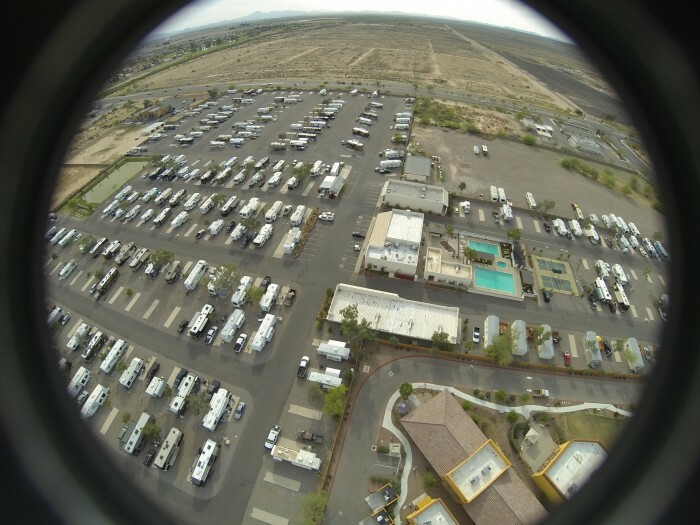 We camped at Casa Grande RV Resort in a Fifth Wheel. Info says free high speed wifi, they have no wifi. Pretty much a workers park. Pretty much those leaving leave junk and it's never picked up. If you have dogs there are a LOT of tiny sand burrs. Be prepared for pricked fingers. Sites are small. People are friendly both staff and workers staying there. Water fittings buried in the sand. Only stayed a few nights. Would not stop again. We camped at Hat Creek Rv Park in a Fifth Wheel. Sites are way to narrow. When they are parked every other being opposite directions you connection side almost is slide against slide and the open side almost has to share space with you neighbor. Trees can be a problem as we had to back in and out several times to keep a large branch from tearing the roof. Railroad ties define each space which make it even harder to move your trailer. Sites are gravel and pretty level. Lots of 35e highway noise. Super friendly staff. Very clean park with a lot of mature trees. We camped at Destiny Dallas RV Resort in a Fifth Wheel. The park has nice concrete pads with plenty of space. The only negative for us was staying when winds where 20 and gusting to 35. There are no trees or other things in the park to slow down those rock your trailer winds. Other than total open space the park is nice and we'll kept. Probably would not go again but only because of the open space. We camped at Deer Creek Valley RV Park in a Fifth Wheel. Came back for another year despite the rocks, wifi and price increase. Large rock issue had been taken care of. WIFI still non-existent although their web page says it is the best in the valley. People are still great and a lot of the same staying year after year keeps us coming back. Quit doing the meals etc but have heard good things about them. Rarely if ever do any of the amenity type things so they don't mean as much to us as they do to others. 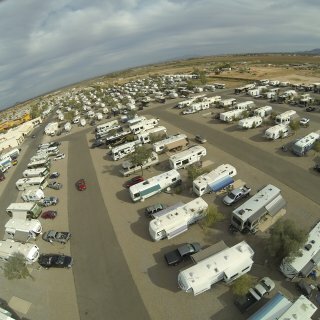 We camped at Casa Grande RV Resort in a Fifth Wheel. Close to Fry's and the city has everything like Sam's club Safeway, Walmart, Very good and cheap Chinese eats called China King. Several good higher end restaurants and most anything else you might need. Super windy for the entire week we where there. WiFi is iffy which is exactly what they will tell you before you even book. Had a great back in site overlooking a golf course large pond. Nice level site but very dusty. Temp was perfect but too windy to be outside. Walking distance to Avi casino butlong drive to anything else. Other than the wind the park and casino where great. We camped at Laughlin / Avi Casino KOA in a Fifth Wheel. Unless you want a 20 minute or longer drive, Avi casino is you only choice. Amid promises of large shifting rocks being removed and replacing the WiFi of 2015 we returned. Home page touts best WiFi in the valley and that is 100% BS as it is still the worst we have ever had. Large rocks that require re-leveling every week are still prevalent. The meal program went from $7 and great home cooked meals to $10 and catered so so meals. Typically like to winter here but now not so much. People close by came in for 2 months and are paying $750 as a monthly rate plus 19 cents for electric that park pays 15 cents for. Made it short stay. Too bad, it was the best park we had stayed in before this. 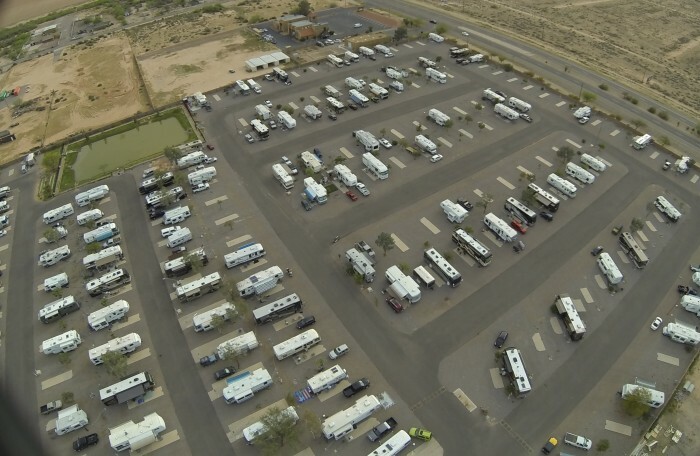 We camped at Casa Grande RV Resort in a Fifth Wheel. Spaces tiny. Large tree branch may have done some roof damage. Hard to get in an out of with 38 foot 5th wheel. Easy off and on from freeway. Would not stop again. We camped at Coachlight Inn & RV Park in a Fifth Wheel. Concrete slab that was perfectly level, super clean with large lots. Several rest room areas. Nice layout. Was just a 1 night stop for us but would certainly recommend this park for long or short stays. Even our 38 footer had room to leave the truck hooked up for single overnight. Scale of 1-10, it's a 12. We camped at Oasis RV Resort in a Fifth Wheel. Noise-no whispering here-planes, train and automobiles. Sites are short for long trailers. Just a few nights stay was a good quick stop value at Passport rates. Sites are hard packed gravel so easy leveling etc. Bit of a PITA to get into with large trailer but lots of room for turning when pulling out. Very helpfully and friendly staff. Easy off and on from freeway. All in all probably would not stop again just because of 38 foot trailer length but would still recommend for shorter trailer and quick stays. We camped at Whispering Palms RV Park in a Fifth Wheel. Really nice park and atmosphere, very level sites. Did 2 nights and would certainly go back for a longer stay at some time in the future. 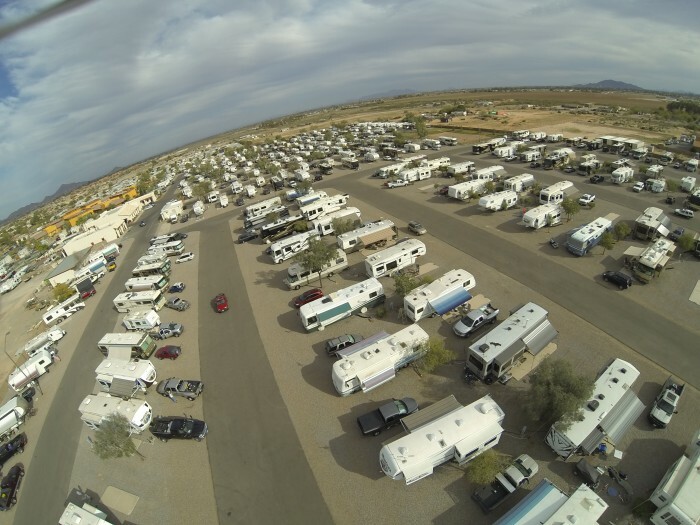 We camped at Van Horn RV Park (formerly Van Horn KOA) in a Fifth Wheel. Very small spots. Had to drive around to find decent site to pull 38 footer into and leave it hooked up since it was 3 AM and just a place to sleep. Highway noise. We camped at Kansas City East Trailside RV Park in a Fifth Wheel. Old park with very small spaces but nice people and easy to get in and out of. Would not do a long term stay. We blocked and paid for a week but left after 5 days. IMO a bit expensive for what it is. We camped at Sandy Lake RV Park in a Fifth Wheel. We do 4 months here over Winter. Love the people, food, activities and amenities etc. Worst WiFi we have ever encountered and has been for a couple years. Bring your own hot spot or give up on being on line. After all the complaints we have made and heard its amazing there's been nothing but bogus reasons and no improvement. Would rather pay for reliable service. Large fresh rocks in many spots make it hard to be level and be sturdy. You think you are going in level and one side does a 4 inch trench. Pull out and try again and finally get level. 3 days later one side sinks into the rocks and there you go again. We will keep coming here for the other things but would really like to see small rocks for solid sites and reliable WiFi. 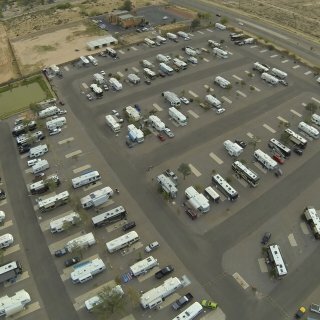 We camped at Casa Grande RV Resort in a Fifth Wheel.